This calculator estimates the temperature felt by the body as a result of air temperature and relative humidity. Heat index is often referred to as humiture, and is similar to wind chill in its attempt to measure perceived, rather than actual temperature. For example, an air temperature of 83°F with a relative humidity of 70% would result in an estimated 88°F perceived temperature. Like the Wind Chill Temperature Index, the heat index used by the National Weather Service (NWS) in the United States is based on many assumptions such as body mass, height, clothing, individual physical activity, blood thickness, and wind speed. As such, depending how significantly these assumptions vary from the reality of an individual, heat index estimates may not accurately reflect perceived temperature. The equation used by the NWS to estimate heat index was developed by George Winterling in 1978, and is meant to be valid for temperatures of 80°F or higher, and relative humidity of 40% or more. The actual equation used by the NWS (as well as this calculator) is available through the NWS website. Below is a chart listed results of the equation. The temperature equivalent perceived by humans as a result of air temperature, relative humidity, and wind speed, is sometimes referred to as apparent temperature. This apparent temperature can have potentially severe medical effects. Under high air temperature and humidity (high heat index) conditions, perspiration is hindered due to reduced evaporation as a result of high humidity. Sweat is the human body's physiological response to high temperatures, and is an attempt to lower body temperature through evaporation of sweat. When this is hindered, overheating and dehydration can occur, with varying severity. 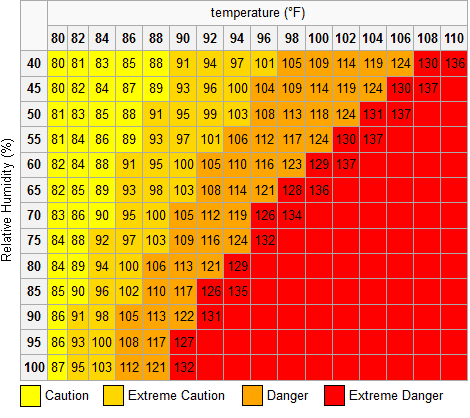 Below is a table indicating possible complications at varying levels of heat index values, obtained from Wikipedia. 27-32°C 80-90°F Caution: fatigue is possible with prolonged exposure and activity. Continuing activity could result in heat cramps. 41-54°C 105-130°F Danger: heat cramps and heat exhaustion are likely; heat stroke is probable with continued activity. Over 54°C Over 130°F Extreme danger: heat stroke is imminent.